Have you stumbled upon any signs or symbols in unexpected places lately—messages meant just for you? I have. I’ve been taking some time this summer to contemplate my next projects and have been working my way through folders and folders of ideas—scraps of paper with ferocious scribbles, printouts of articles, notes, and quotes I slavishly save. In one folder, stuffed between some odds and ends, were what looked like two sheets of scrap paper I had folded in half to take notes on (I’m big on re-using paper). I drew in a deep breath and let out a big sigh. I needed that reminder. . . thanks. I really had been hard on myself that week, feeling that I wasn’t producing fast enough. That same week, as I was looking through another stack of papers, I saw that I had mistyped part of the name of a magazine article I had written down. Instead of “Go Ahead” I had written “God Ahead.” Ah—another message, reminding me that I wasn’t alone, I didn’t have to struggle so darn much, and the guidance I was looking for was right there, just ahead. Of course, I’ve known for a long time that signs, symbols, and messages—like an intricately designed spiritual feedback loop created personally for us—are all around if we watch and listen for them. But in my panic to push myself, I needed a reminder, and there it was. I knew it wasn’t a mistake to see those two messages just a few days apart. These signs, divine direction, if you will, come in all shapes and sizes. It may be as simple as turning the page of a magazine and having a headline pop out as if it were speaking directly to you. Or waking up with a string of words in your head. Or walking by a message a child scrawled in the sand that answers the very question you’ve been pondering. Or getting a busy signal over and over when you call to make a certain appointment, showing you that this isn’t the right next step. 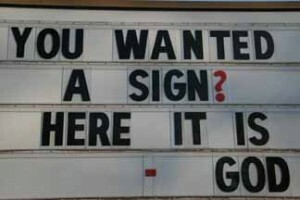 – What signs or symbols have you stumbled upon in unexpected places? – Where have they led you? – Are you watching and listening for them? Join the conversation and share your thoughts . . .